Posted by Bruce Carroll at 7:14 pm - October 7, 2008. 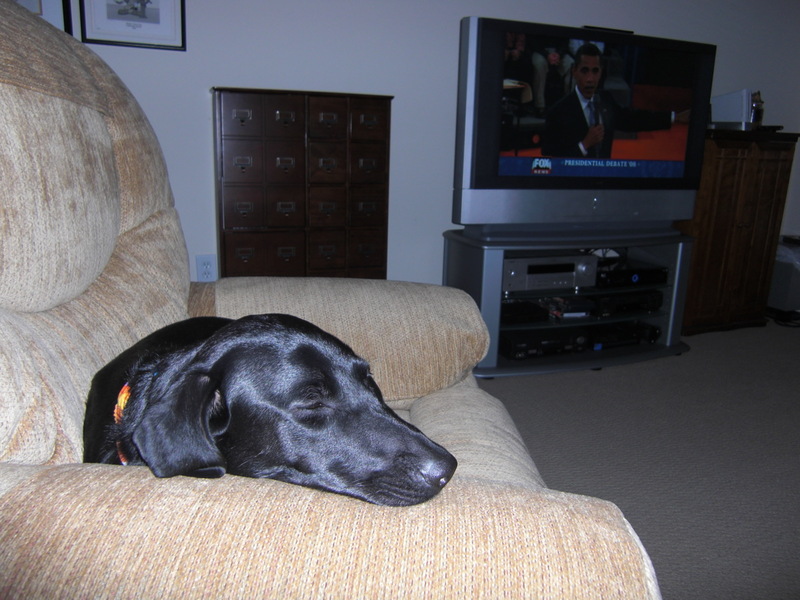 Tonight, GayPatriot will debut a worldwide first:Â A Presidential Debate live-blogged by my dog, Shadow.Â Â I know, it is very exciting and groundbreaking.Â We aim to serve here. Â I have modified a keyboard in order for her to adequately type without a thumb with direction from the Dr. Emmett Brown Institute for Future Technology. I will be monitoring her live-blogging and may insert my own editorial comments throughout.Â Shadow will begin posting here at this link shortly before 9PM Eastern time. 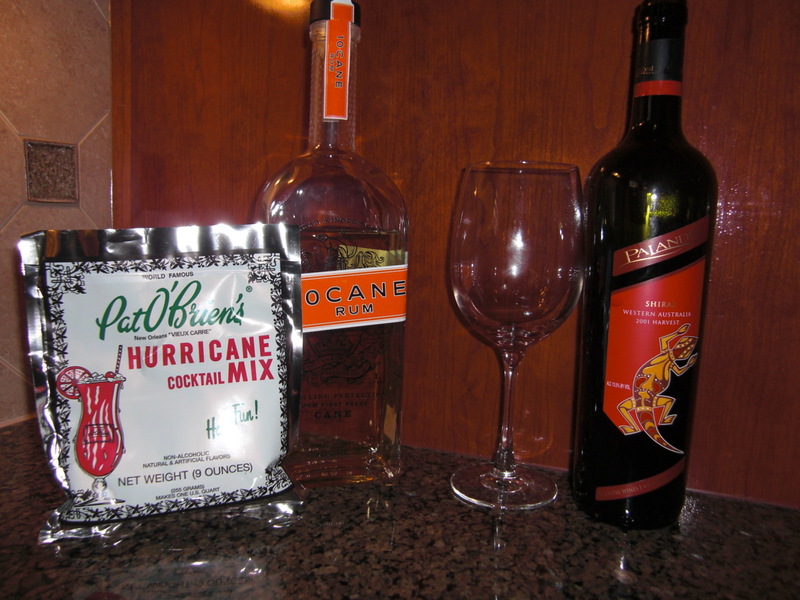 Finally, while I Vicodin-Blogged the Vice Presidential debate… I’m considering two options tonight.Â Â You get to choose! UPDATE: Shiraz wins. Glass is poured. 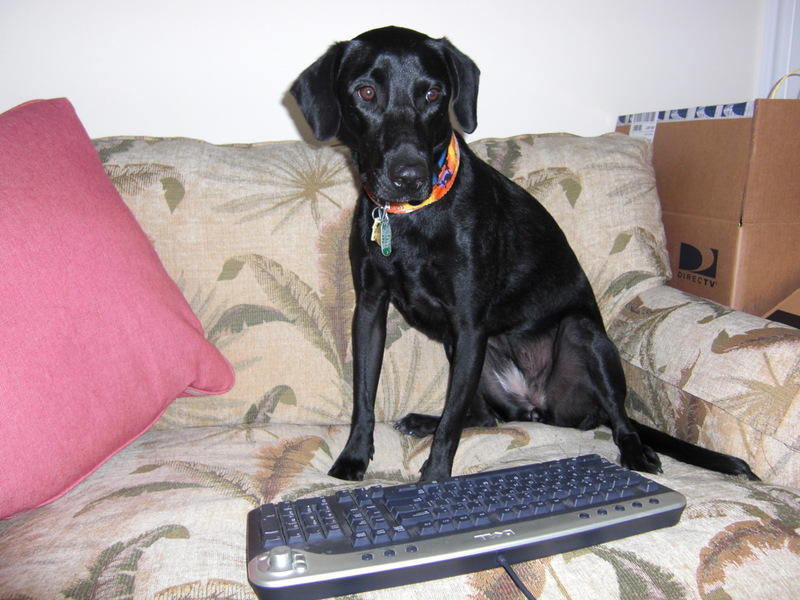 I am now turning the blog over to Shadow for her live puppy-blogging. 9:00PM – hello peeple.Â i am shadoe and i like sarah palin.Â is she on this debate tonight? i am sowwy that i cant spell good.Â i am only three. 9:04 PM – first question is from mr. clean.Â did he look in the mirror with that color combination? dad says every time obama says ‘aaaaand’ and ‘uhhhhhh’ i get a doggie biscuitÂ Â he will be taking a gulp of wine. who is the old guy in the undertaker’s suit? Posted by GayPatriotWest at 6:18 pm - October 7, 2008. It seems that Barack Obama has picked the perfect theme for this campaign, “Change.”Â Â People are tired of the ways things are being done in Washington and want government to change those ways.Â Fortunately, for Obama, the media haven’t challenged him on how his policies will differ from the current modus operandi in our nation’s capital. Obama may talk of a “new kind of politics,” but he has become a creature of the old politics.Â He’s not offering us any new ideas, just the same old tired liberalism dressed us with fancy rhetoric and presented by a more dynamic personality than Democratic nominees past. The Democrat has surged ahead in most polls not because of his ideas, but because he’s from the political party opposing the one in power–whom people blame for the crisis.Â If anything, Americans reject the statist rhetoric he would spouts. So, it’s up to John McCain tonight to do what he did in New Mexico yesterday and make the case not only that he has done more to fix the problems which created the current financial crisis, but that he is better suited to manage it once he takes office next January. McCain has heretofore lacked a coherent economic message.Â And yet he has the stronger argument, more in tune with what Americans want than that of his rival.Â Not just that, he also has a better understanding of the mortgage meltdown which led to the current crisis.Â Meanwhile, many MSM organs pretend McCain didn’t even address the economy in his New Mexico address. Posted by Bruce Carroll at 5:00 pm - October 7, 2008. 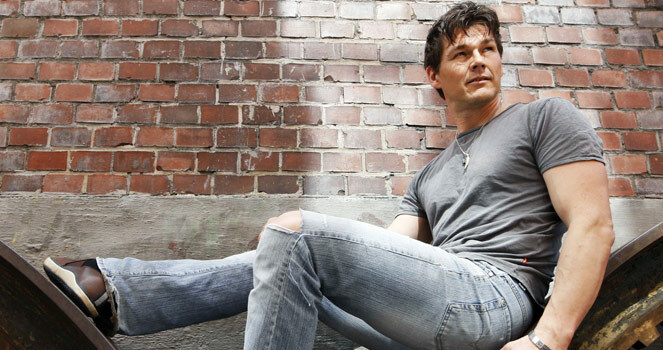 By the way, in case you care… here’s what the lead singer of a-ha, Morten Harket, looks like today. Daaaaaamn. Gimme some of that youth potion, dude! Why Won’t Democrats Investigate Fannie and Freddie? Posted by GayPatriotWest at 3:18 pm - October 7, 2008. I’m not the only one to notice my Congressman’s failure to look into the role of Fannie Mae and Freddie Mac in the financial meltdown.Â Even though the jurisdiction ofHenry Waxman’s Oversight and Government Reform Committee includes the government-sponsored enterprises (GSEs), at the heart of the current crisis. In yesterday’s hearings, Waxman and his Democrats “grilled Lehman Brothers executives over CEO pay and ‘deregulation’, but never mentioned the names Fannie Mae and Freddie Mac.“Â Seems they so want this scandal to fit their narrative of the private sector run amok that they won’t address the role federal regulation and government-sponsored enterprises played. Methinks Waxman and the MSM are ignoring this because of their faith in government institutions and of their distrust of the private sector.Â They don’t want to confront evidence which upsets their worldview.Â Government regulation, they believe, can’t be responsible for the problem–or even have a share in it because it’s the remedy they seek. Democrats just don’t want to believe that government might be part of the problem. Posted by GayPatriotWest at 2:21 pm - October 7, 2008. Whenever I ask Obama-supporting friends about their candidate’s absence of executive experience, they assure he’ll do fine because he’ll surround himself with good people. Yet, when we look at the people with whom he’s associated in the past, we began to wonder if this is so.
. . . the country does not deserve to be put in the hands of a glib and cocky know-it-all, who has accomplished absolutely nothing beyond the advancement of his own career with rhetoric, and who has for years allied himself with a succession of people who have openly expressed their hatred of America. And given those alliances, shouldn’t the media be asking who would advise Obama if elected? And shouldn’t then the American people wonder about his associations? UPDATE from Bruce (GayPatriot): I think this documented, fact-based research from the GOP spells it all out for even Priya to understand. Posted by Bruce Carroll at 10:21 am - October 7, 2008. Barney Frank makes it official…..
Has Barney Frank No Shame? Posted by GayPatriotWest at 7:42 am - October 7, 2008. U.S. Rep. Barney Frank claims conservatives are trying to partly blame the nation’s economic woes on black people. “This is an effort I believe to appeal to a kind of anger in people,” Frank, a Newton Democrat who chairs the House Financial Services Committee, today told a Boston foreclosure-prevention forum. Frank charged that conservatives aim to shift blame for the market meltdown away from Wall Street and toward minority-lending laws like the federal Community Reinvestment Act. Um, Barney, if you bothered to read the conservative stuff, you’d find they’re looking at more than just the Community Reinvestment Act. It’s not they, but you who are trying to shift the blame. What is it with liberals? Instead of taking responsibility for their own messes (or, in the case, their own involvement in a mess which had many authors) and blame others. Unable to acknowledge conservative arguments, Barney Frank has decided that Republicans harbor racist sentiments. I guess he just borrowed a page from the liberal playbook. He’d rather level false and absurd charges against conservatives than accept his responsibility. Once again, let me repeat, in the interest of recovering from this financial mess with plunging further into recession, Barney Frank should resign from the House Financial Services Committee.